Photo of autonomous Ioniq courtesy of Hyundai. 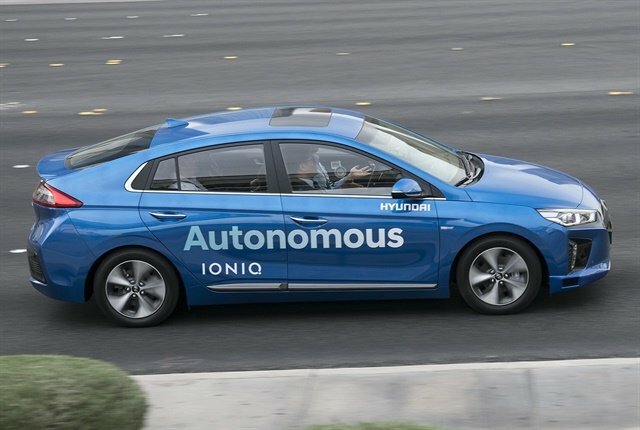 Hyundai and Volkswagen have signed deals with Pittsburgh-based Aurora Innovation to use its self-driving software in their bids to develop fully autonomous vehicles for commercial service. While Volkswagen didn't give a timeline for when it would offer a self-driving vehicle for sale, Hyundai plans to offer a Level 4 autonomous vehicle in the marketplace by 2021 that can operate without human input or oversight under certain conditions. Hyundai will show its next-generation hydrogen fuel cell vehicle at CES. It will become the first autonomous vehicle Hyundai will test on public roads starting this year. A hydrogen-powered vehicle is ideal as a self-driving car because it can "provide a stable electric power supply without concerns about driving range," according to Hyundai. Volkswagen plans to develop a fleet of self-driving electic vehicles in cities and deploy them as a mobility service. "Our vision is 'mobility for all, at the push of a button,'" said Johann Jungwirth, Volkswagen Group's chief digital officer. "In the future, we anticipate that people will be able to use our mobility app or digital virtual assistant to hail a self-driving electric vehicle to drive them conveniently door-to-door, or use our Volkswagen OneButton which has GPS, connectivity and a compass, as a small beautiful key fob with maximum convenience." In the past six months, the automaker has been integrating Aurora's self-driving system into its vehicles in the Volkswagen Automotive Innovation Lab at Stanford University. Founders of the startup, which was launched in 2017, have roots in Silicon Valley as well as an office in Palo Alto, California. Cofounder and CEO Chris Urmson was a founding member and technical leader of Google's self-driving unit. Sterling Anderson ran Tesla's Autopilot program. Drew Bagnell was a leader in Uber's autonomy efforts. Bagnell and Urmson worked on the entry from Pittsburgh-based Carnegie Mellon University into the Darpa Grand Challenge. In 2005, a team of Volkswagen and Stanford won the challenge.